Kansas State University was one of 13 prominent research institutions in the United States that joined the SoAR Foundation to call for a surge in federal support of food and agricultural science. “Retaking the Field,” a report released by this coalition, highlighted recent scientific innovations and illustrates how U.S. agricultural production is losing ground to China and other global competitors. 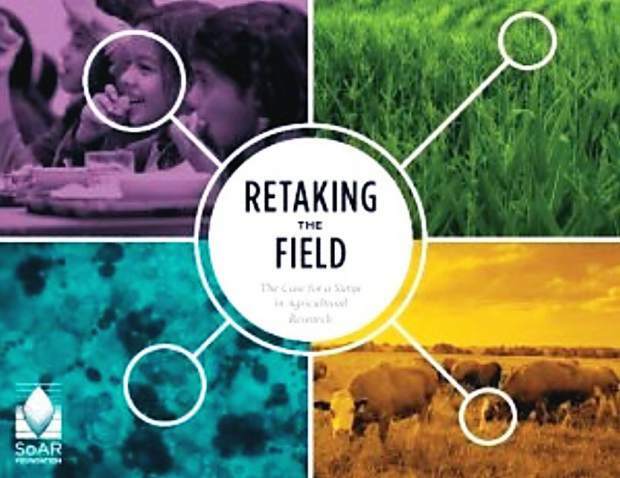 “Retaking the Field” looks at the importance of agriculture and its related industries to the U.S. economy. According to the U.S. Department of Agriculture, this sector was responsible for nearly 1 in 10 jobs in 2014 and contributed $835 billion to the U.S. gross domestic product. Even though every public dollar invested in agricultural research provides $20 in economic returns, the federal budget for agricultural research has remained flat for decades. Today, the U.S. trails China in both agricultural production and public research funding. “The first introduction of PEDv (Porcine Epidemic Diarrhea Virus) into the U.S. swine industry in 2013 was devastating with approximately 60 percent of the sow herds becoming infected with many herds reporting 100 percent piglet mortality at the onset of the infection,” said Jason Woodworth, KSU research associate professor. Woodworth and his team first confirmed pig feed as a path of transmission for the virus. Their efforts are highlighted in the report. The K-State team played a critical role in containing the outbreak. The cumulative incidence of PEDv infections dropped from 56 percent in 2013-14 to 6 percent in 2015-16. Farming has never been an easy endeavor and today’s challenges to agricultural production are daunting. The historic California drought continues and U.S. production is also threatened by new pests and pathogens, like the 2015 Avian Influenza outbreak that led to the culling of 48 million birds in 15 states and $2.6 billion in economic damages.